When Can Baby Have Oranges and Citrus Fruits? Are oranges a good fruit to make baby food with? Unfortunately, oranges, like all citrus fruits, are acidic and are likely to give babies younger than 12 months old rashes. The acid can cause terrible diaper rashes and even rashes around the mouth an lips due to the high levels of acidity. With that being said, many parents have offered their younger infants tastes of oranges, orange juice or other acidic fruits and have had no reactions. If you want to introduce citrus earlier than by all means give it a try but please be on the lookout for possible reactions! With new studies being released since 2008, the AAP now says that there may be no need to delay foods that are typically allergenic. This applies mostly to babies who have no known allergy/sensitivity risks. If you wish to introduce citrus foods earlier than previously recommended, just watch for any reactions. As with other acidic foods, if your baby is prone to sensitivities with foods, you may want to wait to introduce Oranges until after his first birthday. We all know that oranges are high in vitamin C; did you know that one orange contains approximately 12% of the RDA for fiber too? Not just a great source of vitamin C, oranges have a myriad of vitamins and other nutrients that make them tops for a refreshing and healthy snack. What Fruits are Considered Citrus Fruits? Check out Citrus at Cooks Thesaurus for interesting citrus facts. Pineapple is not Considered a Citrus Fruit – Can My Baby Eat Pineapple? Pineapple is not a citrus fruit (it’s in the bromeliad family actually.) however it can be acidic. Processed pineapple tends to be less acidic due to the processing and sugar/syrup that it’s packed in; but I’m sure you’d rather not give your baby pineapple out of the can. If your baby does not have any food intolerance’s and has shown no propensity to getting rashes due to foods, then you might give it a try around 10 months old. Many parents do feed their little ones pineapple around 8 months old. For pineapple, mash it up and add it to yogurt, cereal, chicken (yum.) even sweet potatoes. Pineapple tends to be fibrous and if it’s too fibrous, give it a gentle steam and see if it softens up enough for your baby. Can I use Citric Acid (Lemon Juice) for Freezing and Retarding Browning in Homemade Baby Foods? A sensitivity to citric acids (like those in lemon, tomato, grapefruit, oranges) is generally not found after 12 months old. Ascorbic Acid is Vitamin C and seldom will you find anyone with an allergy or severe sensitivity to Vitamin C. Ascorbic Acid is added to many fruits to boost the natural Vitamin C content of the fruit as is Citric Acid. These may also act as a preservative and works to stop fruits from turning browm. Many people ask about the possibilities of allergies to these citrus acids – odds are, your baby will not have an allergy to these 2 compounds. Your baby may however, have a sensitivity to the acid. 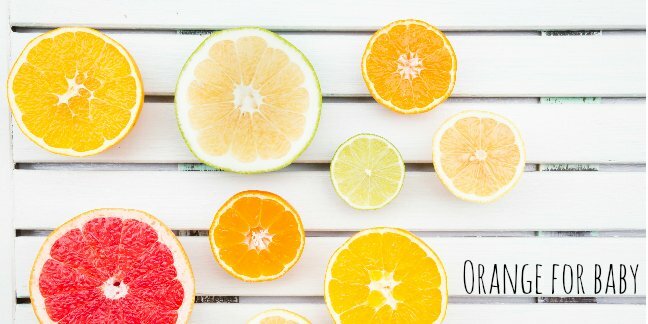 We are told to stay away from citrus fruits (such as oranges, pineapple, lemon et al) until baby is 10-12 months due mostly to the acidity of the fruit – diaper rash, skin rashes and tummy pains are some things that come from a sensitivity to citric acids – not due to any allergic reactions. There is a big difference in using a drop or 2 of lemon juice as a preservative in a fruit purée. As the drop or 2 is spread throughout the purée and your infant will not be consuming the drops with each bite of fruit purée that is taken. It is entirely different than offering your baby a few slices of oranges or chopped tomatoes for example. Nope, I don’t recommend serving a baby pureed oranges. Would you eat pureed oranges? Why not peel, section the orange and then cut into small pieces? You may have to peel off the membranes – that stringy stuff that covers the “meat” of the orange before you serve it however. Step 1: Puree the orange then add the yogurt and thoroughly whizz to combine. YUMMY, healthy and cooling on a warm day. Pop a cube into a baby safe feeder/mesh feeder for a nice treat that is sure to soothe sore teething gums. If you feel your baby might be able to handle oranges, try orange juicy carrots. Step 1: Add 1 cup water and 1/4 cup orange juice to a 1/2 pound of peeled and diced carrots in a medium sized saucepan. Step 2: Steam carrots until tender then add a pinch of cinnamon. You can also combine the above and bake in a 375F degree oven until the carrots are fork tender – approximately 20-30 minutes. Baking carrots this way is truly tasty! Yogurt – make Orange Yogurt Freeze Pops.